Pinning down a definition of music is harder than it sounds. A song composed by a human easily fits into the category of music. But what about a song composed by a bird? Or the rumble of a freight train? Steven Pinker is a cognitive scientist at Harvard, and he’s written best-selling books about evolutionary psychology and language. He says music is tied to language. “Music has a set of rhythms within rhythms that can align uncannily with those of speech,” Pinker says. There’s an ongoing debate about whether music is “adaptive” — whether it serves a direct evolutionary purpose. Steven Pinker doesn’t think it does. He’s argued that music is a happy byproduct of some other evolutionary adaptation. That idea stirred up some controversy when he first wrote about it in the 1990s, and it still does. Pinker thinks there’s probably a strong connection between music and our use of language, but there are other possibilities as well. In his book “How the Mind Works,” he laid out six hypotheses for what music draws on. Language is only one of them. Others are rhythm and motion; environmental sounds; emotional calls like moaning, laughing or weeping; and habitats like babbling brooks and chirping birds. Pinker says his sixth hypothesis is that music draws on something we don’t yet understand, having to do with how the brain processes periodic patterns and rhythms. If music is linked to language in our brains, one might think we use music to “tell” something to each other. But Pinker doesn’t believe that’s true. He doesn’t think music “tells” us anything, but it’s certainly capable of stirring our emotions. Pinker is referring to the almost sound-effect like way music is used in film. Strings play during sad scenes, cymbals and drums during suspenseful scenes. Pinker says music has some elements of language, but it’s limited in many ways. Music, like language, has syntax — patterns and rules in the way it’s formed. But Pinker says it doesn’t share the semantic aspect of language — communicating a specific meaning, all on its own. 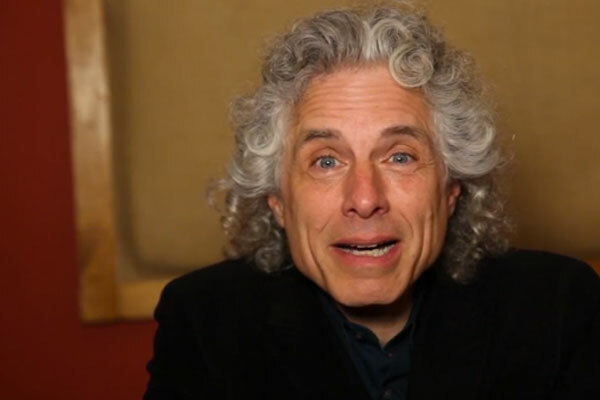 “It’s certainly impossible to narrate an actual plot using melody alone,” Pinker says. Words, Pinker points out, can spin out tales and stories in a way that music simply can’t. Even if music doesn’t tell a specific story, Pinker says there’s intense mental activity associated with it. Music theorists like Deryck Cooke have tried to work out emotional “semantics” for music. “He was kind of ridiculed by his fellow music theorists, because whatever claim he made, they’d find a counterexample,” Pinker says. Pinker believes that there is something to Cooke’s research, though. He says Cooke did as well as possible, given the nature of the topic. Pinker says the emotional reaction music provokes is easy enough to gauge. Hello! I agree with Pinker and I was studying to become an opera singer or singer actress-we are trained to stir the emotions. Few people would understand my French or German or Italian but they would kind of understand my phrasing, inflection, dynamics and rhythms. Singers hold no delusions about being scientists or healers. I know psychological science from studying psychology and science and my singing (it’s a break from science) comes from studying with a voice teacher. She hears and corrects from a system of teaching voice. Opera singing is nothing like singing pop or R&B or rap or jazz…..there is a definite system and structure. It is based slightly on speech but my speaking voice and singing voice are entirely different. He’s right there is no evolutionary value in music but it takes you into another worlds and other possibilities through sounds and emotions. yes, Ms. Gaskins, opera singing is much different than singing with any microphone requirements. The vocal chords are amazing little creatures that are lubricated by the “false vocal chords.” In case the Maestro says something like “spit out your tone” that’s ok (regardless what anybody else thinks) so that your voice can carry over the lip of the stage. As Stravinsky often argued, music can express only itself. But we do have somewhat common emotional correlations with music, no? People can tell the difference between “happy,” “sad,” musical phrases, etc. We know how to trigger emotional responses using specific tricks. In his book, Ragas of Northern Indian Music, Alain Danielou catalogs the emotional meanings of specific phrases used. In The Unanswered Question, Leonard Bernstein tried to apply certain Chomskyan linguistic ideas to music. Totally worth checking out. I want one of those Magic Instruments Guitars. How can I get one? I am not really great with English but I line up this very leisurely to read.